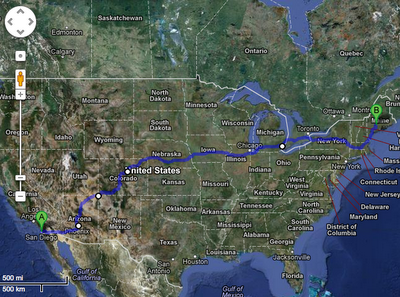 This coming summer we are packing our clutter and driving... And driving... And driving to Maine. Where our little house on the lake sits and awaits our arrival. It's been waiting for 2 years and we are finally coming. We have concluded what we came to San Diego to do and need to tend to business on the East Coast. 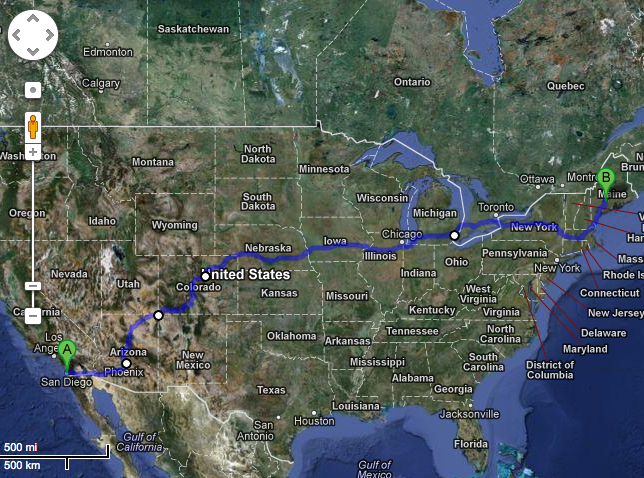 As our friends have pointed out this is the farthest we could drive without leaving the country (yes, Alaska is closer... I checked!). Naomi- Mommy will it be winter when we arrive even though it's summer here? Me- No, we're not crossing the equator this time so the seasons stay the same. Naomi- So I won't have a second summer? Me- No, but as we drive we'll have to keep changing the clocks, because the time WILL change. Naomi- TIME will change? Wow. Safe travels...we head out this week for Maine to spend a month. Fortuanately our drive is only 9 hours and no time changes!